Equivalent to calling isSatisfied(const State *, double *) with a nullptr second argument. 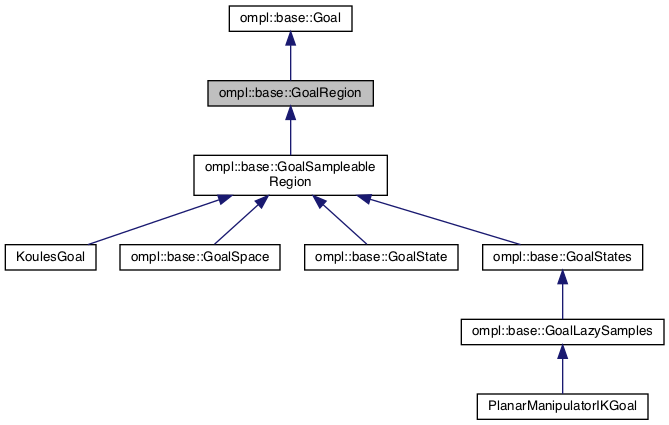 Print information about the goal data structure to a stream. Set the distance to the goal that is allowed for a state to be considered in the goal region. Get the distance to the goal that is allowed for a state to be considered in the goal region. Constructor. The goal must always know the space information it is part of. Check if this goal can be cast to a particular goal type. Get the space information this goal is for. Since there can be multiple starting states (and multiple goal states) it is possible certain pairs are not to be allowed. By default we however assume all such pairs are allowed. Note: if this function returns true, isSatisfied() need not be called. The maximum distance that is allowed to the goal. By default, this is initialized to the minimum epsilon value a double can represent. The space information for this goal. Definition at line 47 of file GoalRegion.h.